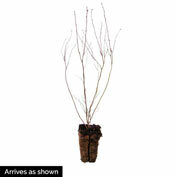 Patriot Hybrid Blueberry | Gurney's Seed & Nursery Co. Produces up to 20 lbs. of fruit per plant. 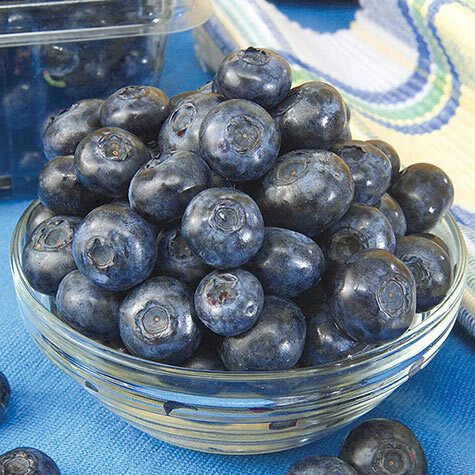 Deep blue, highly flavored fruit ripens in July and is larger and firmer than most. Low-growing, spreading bush grows to about 4 ft. and is excellent for landscapes, turning fiery orange, yellow and red in the fall. 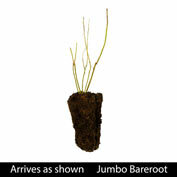 Patriot is adaptable to many soil types, shows good resistance to root rot, and can withstand wet soils better than other varieties. Zones 3-7. Height: 4 - 6 feet. Spacing: 4 - 6 feet. Pollinator: Self pollinating. Another highbush variety will increase yields. Yield: Approximately 10 - 20 pounds at maturity. 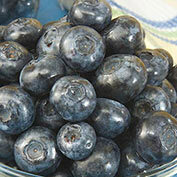 Fruit: Tight clusters of large, slightly flat, medium blue berries. Soil Requirements: Acidic, moist, organic, well-drained soil. pH should be 4.5 to 5.5. Pruning: Blueberries should be pruned during the winter while the bushes are dormant. In Winter, flower buds are easily visible on one-year-old wood and their numbers can be adjusted by pruning to regulate the crop load for the coming year. Comments: Highbush blueberry. Fruit is firm, if weather is not too hot. Small, dry recessed scar on fruit. Resistant to phytophthora. Tolerates wet or clay soils well. Red wood. Very vigorous.